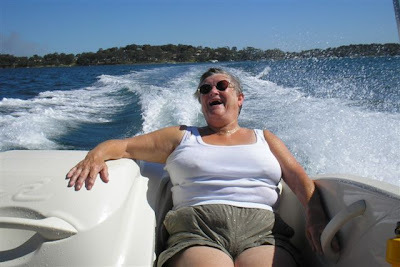 We haven't taken the boat out on the water since we moved house. One reason for this is the trouble we have had getting our boat up the new steep driveway. We had the trailer modified and raised so the engine doesn't hit the concrete as we reverse but it is still a hairy procedure! 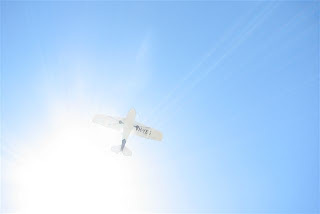 Today was a beautiful day and we decided to have a go. The wind had picked up a lot by the time we got to the boat ramp and we had a hard job getting the boat off the new raised trailer and then pushing away from the shore against the wind. With the help of four blokes who had been having a BBQ we managed to get into water deep enough for the engine to take over. It was a choppy run and a bit scary when Byron realised that we had probably left a plug unscrewed that was supposed to keep water out of the bottom of the shell of the boat. A tricky tie up to a jetty with the wind pulling the boat away and I was told that I needed to get into the water to try and find this plug that was well below water level... I was sinking into knee deep mud as I walked/swam my way around the boat. Eventually I found the plug and it was unscrewed so I had the fun job of getting soaking wet while putting it in. It was a fun start to the day (?) and I have the dubious honour of saying I was the first Baynham to swim in the lake this summer! 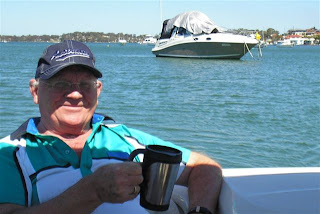 The rest of the day passed much less dramatically with a lovely trip around Lake Macquarie and coffee and biscuits in the sheltered Secret bay opposite our house. Getting the boat back to the boat ramp the wind had picked up again and Byron's Mam got absolutely soaking from the spray! We all had a great laugh at her expense! Getting the boat out of the water was easy and we are home now tired and salty but happy to have successfully given the "Red Dragon" it's first run of the summer. This weekend there was a Catalina Festival in local Rathmines. There was an RAF base there during the second World War and the bay where it was positioned was being renamed "Catalina Bay" in recognition this weekend. There was a festival atmosphere with bands, stalls, vintage cars on show, fire engines and cold beer and bubbly available to sip! 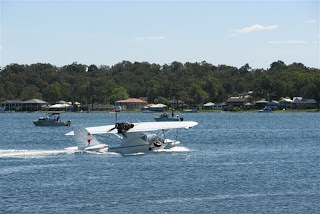 We had a great day watching water planes take off and land. 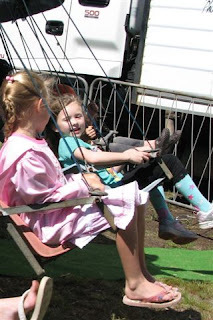 The kids bounced on bouncy castles and had a go on the swing chairs. After lunch we settled in the beer garden and enjoyed a refreshing drink with our friends while the kids played together. "Why aren't you updating the blog???" Lots of you have been asking are we getting slack with the blog? Cian had his 1st birthday party a couple of weeks ago in Sydney. Gareth wasn't able to go because he had been sick all the previous night. There was a second birthday party today in Anne's house for a lot of extended family and friends who live in this area. Anne told Gareth it was being held because he had been too sick to go to the first one! "Seeing Cian" he yawned as he snuggled into his teddy. Tonight was Gareths Pre-School disco. It was on from 5-7pm and all the kids were encouraged to come along with their families. Everyone brings some food to share and the kids run around until they drop with exhaustion! They charge $5 entry per family and as we watched Gareth stuff his face we worked out that we had probably got $20 of value from food alone! Sian was up on the dance floor "boogying" away and Rhiannon spent the evening climbing trees in the playground with her friends! The new pool, Ginas story. A whirlwind few days with a fair amount of stress thrown in but we finally have a pool. It didn't go quite according to plan but the important thing to remember is that we are very fortunate to have a pool in our yard in the first place. Monday was the day of hundreds of phone calls trying to find somewhere to take our 80 tons of earth from the excavated hole for less than the unexpected $9000 bill that Awaba tip were quoting. I stood on the driveway, running late to collect the kids from school, and on the verge of tears not knowing whether to cancel the pool or delay it for a while. Byron came out to wave me goodbye, we had a hug and tried to talk positive by saying that it would be far more stressful if any of us were sick and that a swimming pool was a positive thing that we shouldn't be stressed about. As I reversed down the drive Byron started frantically waving and shouting "STOP" I panicked and slammed on the brakes thinking "what have I done" It was nothing to do with my driving. The wind had just slammed our front door behind Byron and he knew he had no keys, no mobile, no wallet and no way of contacting me to come back until swimming lessons finished in three hours! "Now that's f****** stress" said Mr B in a relieved voice as I ran back up the driveway with the keys to let him in! Tuesday was the excavators . They were due to arrive about 6.30am I had everyones clothes laid out on their bedroom floors to get dressed quickly and easily (even mine!) School lunches were made to reduce panic and stop us running late. I set the alarm for 6am and was just trying to open my eyes when Rhiannon hammered on our door at 6.15 yelling that there was a big line of lorries pulled up on our kerb. There was no time to get dressed so I ran down the stairs with hair sticking up everywhere and opened the door to find myself face to face with Matt. It wasn't a pretty site (for him or me!) He was big and burly and ready to get digging. One of the first things he said to us as he looked at the plans in the back garden was that we shouldn't put the pool where it was planned for. It was 6.20am and my brain was struggling to keep up but we insisted that we wanted the pool exactly where the plans stated. There was a bit of confusion over the distance from the sewer cap and I felt that they were going to dig within a restricted allowance so I spent the next 10 minutes tearing through messy piles of paperwork on my desk searching for a letter from Hunter Water we had received 3 weeks previously. Eventually it was found (filed neatly in a box file instead of piled with all the junk on the desk) Just as the excavator was about to tear into the ground I ran out yelling stop and got them to remeasure and we were half a meter too close. They re-drew the outline of the pool in chalk moving it half a meter away from the sewer cap and started digging. When the hole was dug Byron and myself got a real shock to see that although it was dug as deep into the garden as possible we were left with the shallow end of the pool protruding 0.7 Meters above ground level. When we stepped back down to the patio outside the kitchen door we were 1.7 meters lower than it and were completely unable to see it. Not only were we not going to have the nice appearance of the swimming pool from our patio but we wouldn't be able to keep as close an eye on the kids unless we stood right up next to the pool. We spent the day ringing around the pool company boss and landscapers and fencers trying to see if we could find anyway to change this but by nightfall we were no clearer. It looked like we would have to build a retaining wall 0.7 meter high around the pool (a massive expense) and then build steps up to this new level. If we put the 1.2 meter high pool fence on top of this wall (a legal requirement) we would have a distance of 2.9 meters high from our patio up to the top of the pool fencing and would feel like we were in a cage. We were so upset and unsure of what we could do. We had a night of very little sleep before getting up at 6am again on the Wednesday to meet the next part of the crew Mick (Matts brother) It was a bit deja vu with me in pj's with hair everywhere looking at a bigger burlier version of Matt through blurry eyes. We had a chat out the back next to the excavated hole and were told in no uncertain terms to make up our mind. Were we installing the pool today or not? We were given the option to stop everything there and then and resubmit plans to council for a pool in a different position. If we wanted to do this Mick held his mobile out and said it had to be done right there and then as the crane and pool were on the way. Without enough time to really think it through (it was now 6.30am) we decided that if there was no alternative we would just have to go for it and make the best of it. Within 5 minutes a truck drove past with the pool on its side and within half an hour the crane was lowering it into the ground. The fencing company rang us and suggested that we not go ahead with the permanent fencing as planned because we needed time to consider alternatives before making a final choice. They arranged temporary fencing too be delivered and installed to comply with legal requirements. So here we are on Thursday with a swimming pool successfully installed but not quite ready to use. We need to give it a few days to settle into the ground and need a concreter to seal a concrete walkway around the edge for the paving slabs to be laid on. It's not quite what we had imagined but we are sure that when the dust settles and the landscaping is done around it and we make a decision as to where to place the fencing it will be a wonderful addition to the garden and we look forward to many hours of fun in it. We've certainly had a busy time since we moved into our new house in April. Fencing, driveways, paths, retaining walls, landscaping and within the past two weeks our patio was laid. We've hardly had a chance to catch our breath and enjoy what we have. I'm not complaining, but I'm really looking forward to being able to just sit in the garden with a cold one and think "job done". Each completed job in the garden seems to mean that another one needs starting. We have no plants and very little turf at the moment. It's a good feeling though to know that we're rapidly reclaiming the muddy building site that we inherited a few months ago. With thanks to our very generous family, 6 weeks ago we applied for planning permission for a pool. And guess what? It's in. Check out the superb time-lapse movie Gina put together of of the pool being dug out and delivered today. So, is that it for the pool? Can I relax now? Of course not, now we have to install pool fencing, tile the surround, put a path towards it and perhaps some steps. Can anyone lend me a fiver? Who knows, maybe I'll get that cold one sometime soon, maybe with my toes dipped in the water. 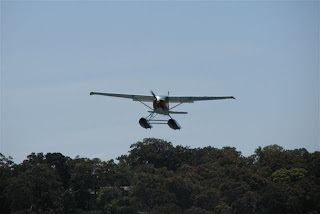 2 weeks ago my folks decided to maximise their time in Australia by travelling further afield. They booked flights to Brisbane, hired a car for 28 days and armed with a map they left on their adventure. 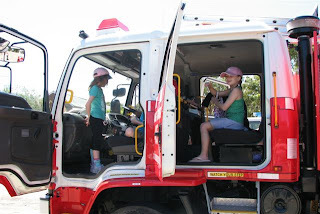 They've certainly been busy, travelling through Queensland visiting places such as Brisbane, Harvey Bay, Toowoomba, Texas, Armidale, Gold Coast, Glen Innes and the Sunshine Coast. They've just crossed into NSW and are travelling south via Byron Bay and at the moment they are in beautiful Coffs Harbour. They rang from a phone box as there was no mobile phone coverage and said they would ring again soon. "Great" I said, "enjoy yourself but keep in touch". Luckily, they at last called this afternoon to say that they were having such a great time that the time had flown and hadn't realised it had been a week since they last made contact. This weekend marked the end of this years rugby season for Sian and Rhiannon. There was a presentation on at a local club. We found a table with Harry, Tom and Isaacs families and watched them line up and be presented with a medal, group photo and club hat. They were given a bag of chips and a can of fizzy drink and ran around the hall like lunatics burning off the sugar and e-numbers! Afterwards we went back to Maree and Johns house and had a great afternoon watching the kids splash around in the swimming pool while we tucked into a lunch of random tasty things we had all brought with us! As the light faded we had one last natter in front of the window and watched the sky turn various shades of peach and orange before reluctantly dragged the kids up from playing on the jetty to go home. A whole year of watching him change from an adorable little blob to an adorable little boy! He really is the cutest little thing with a face that can change from serious and puzzled to a cheeky smile in just a split second! 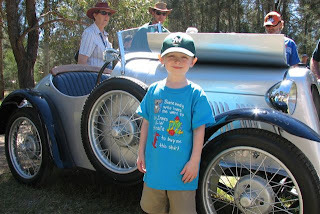 Of course there has never been as cute and adorable a nephew in all of Australia. What else would you expect from such a great gene pool! We were invited to his first Birthday party this weekend in Sydney. Because Gareth was not well Byron had to stay at home with him and I had to do the drive with the two girls. I hate the Sydney roads and with APEC in the news at the moment I wasn't even 100% sure if I could drive my normal route... We made it in good time and Anne pulled up seconds after us so we helped her to carry loads of Helium balloons up the 55 steps to Joe and Rhondas house. The girls looked like they might take flight and float away! The party was lovely and very calm for a house full of crawling babies. As always we were treated to the very best of food and champagne and had a very pleasant day. Sian and Rhiannon were the oldest kids there and were in their elements fussing over the little babies. Normally they are fighting with each other for Cians attention but at the party they had two or three babies each to play with. The cake was a fabulous bright number "1" that Rhonda and Joe had made and decorated together. A brilliant team effort! We brought the last slice home to Gareth and he was so happy that Cian had remembered him! Happy Birthday Cian, We look forward to many more fun days watching you play and grow with your cousins! Granny and Grandad Joe regularly send E-Cards to the kids through the Hallmark web site (with the help on Auntie Carrie the computer whizz!) It is a fun way of sending messages to keep in touch and the kids love them. We were looking at an E-card that they were sent today when we saw that it was "Grandparents Day" We decided to send an E-card back to them and found a fun new type of E-card that allows you to import your own photos into the card. Hopefully somewhere below will be a button to press so you can see Gareths creation! 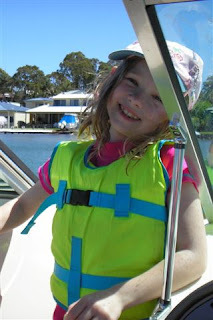 The kids are celebrating Book Week this week and were allowed to go into school in dress-up clothes today. Rhiannon's class were told to dress in the theme "Transport" and Sian's class were "Roald Dahl Characters"
Rhiannon wanted to be a "car driver" This meant that she could dress up in an ordinary weekend outfit i.e. the new trendy dress I bought her last week...! Clever girl but I wasn't born yesterday! Eventually she decided to wear the Singapore Airlines air-hostess outfit that we bought her on the flight to Joe's wedding. I put a bun in her hair and a couple of chopsticks and she was perfect! Sian chopped and changed her mind right up until the last minute, finally deciding to go as the character "Matilda"
Because Matilda had no distinct outfit in the book Sian just wore a simple dress with white knee socks and polished up black shoes. She had a red ribbon in her hair but refused to let me draw some freckles on her cheeks! When I went to say good-bye to Rhiannon the noise in her class was deafening. Her poor teacher looked frazzled. I wouldn't swap places with her today for all the tea in China! At last! We have a patio! Thank-you, Thank-you, Thank-you Paul, Mitch and Shane!!! They have worked themselves so hard in really hot conditions over the last week creating a fantastic patio in our back garden. Roll on summer. I can see the BBQ working overtime! I have drunk enough bottles in my time to know that I don't like cheap plonk. I have not drunk enough bottles in my time to truly appreciate anything more than your average price tag. I digress. The point of this blog entry is to tell you about a very, very expensive bottle of wine I bought this evening. Or two to be exact. I picked up two favourite bottles of red wine in a local bottle shop on my way home from the beach. WolfBlass red label and Taylors Promised Land. Both lovely wines. Just under the $15 dollar mark and perfect to drink with a nice meal or in front of the TV on a Sunday evening. The total bill was $26.98 As always I handed over my bank card and the guy behind the till typed the amount to be paid into the hand-held key pad, pressed "Enter" then passed it to me to type in my 4 digit pin. It was only as I handed it back that the guy realised that the key pad hadn't registered the "Enter" button and my pin number had added 4 numbers onto the £26.98 making the transaction value look like it was an eight figure total! I won't divulge my Pin number on-line but suffice it to say that the two bottles of wine were costing me just over $269,800.00 !!!! Enough to buy a small house! Beat that all you corporate rich men! I think I must have (nearly) purchased the worlds most expensive wine!!! We have had a lovely day today. We woke up to glorious sunshine and not a cloud in the sky. As soon as he was dressed Byron ran outside to his new patio to light up the barbie! He cooked a great breakfast of bacon, eggs and beans and had numerous refills of his strong coffee. A perfect start to a busy day. He was bombarded with presents and cards from the kids, not a tie or pair of socks in sight! Gareth was so proud of a new T-shirt we had found last week for him that said "My Dad can do anything" He walked around with his chest puffed out all day for people to admire! 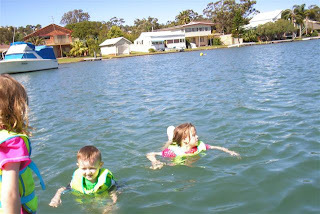 We went to Catherine Hill Bay for a few hours and sat on the beach watching the kids splash around in the icy cold sea. Byron braved the water for a quick boogie board but nearly died of hypothermia and came back out to warm up with a hot cup of coffee from the flask. Because we had a large breakfast quite late in the morning we only started feeling hungry mid afternoon. We packed up and brushed the sand off our feet before heading off to the "16 Footers" a big yacht club nearby. We had a meal and Rhiannon asked Byron "Is this our tea?" When Byron said that it was she asked "What happened to lunch?!!" We had a nice coffee on the balcony of the club overlooking the boats on the lake and then finally headed home, tired, sandy but happy! Countdown to our swimming pool! We got our planning permission through for our pool!!!! It has been less than four weeks since our first contact with the pool company and in only two weeks they will begin excavating!!! Even the pool company have said that they have never had a pool go through in such record time as this! Roll on the 18th of September! The roads started off fairly driveable. They progressed from tarmac to unsealed and ended up being little more than dirt tracks with deep fissures from the recent heavy rains! Despite being in a big chunky four wheel drive with sturdy suspension we were thrown around like clothes in a tumble drier! Byron's Dad was talking about how it was like being in a car rally and I think this made Mr B's driving even more bravado... ! Without having much of an idea where we were or where we were going (the SatNav had long given up on trying to find us!) we carried on driving until we found ourselves at Boardinghouse dam. We have been told many times by Anne and Kel that it is a gorgeous place that they will bring us to some day. Sorry Anne and Kel, it looks like we made it there sooner than we thought. We would still love to go back again more prepared with a big picnic later in the summer. It was a fun day but I'm not sure the car will ever be the same again! 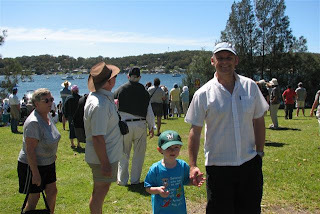 Sian and Rhiannon's school have a sausage sizzle on the Friday morning before Fathers day every year. The idea is to get dads to drop their kids off to school and stay for a sausage sandwich and a tea or coffee. You are allowed to invite your Dad, Grandad or any male figure like an Uncle or family friend. This year we had Byron, Den and Kel! The headteacher stood behind the BBQ with the apron and the tongs and the kids got a laugh out of queuing up to be served their sausages by their teachers!